Energy saving in the home is central to your personal responsibility in reducing harmful carbon emissions as part of wider personal, local, governmental and international initiatives to develop an environmentally more stable environment. Heating cooking, lighting and entertainment are all ways in which fossil fuels can be consumed and carbon dispensed in to the atmosphere. The build up of carbon in the atmosphere is, arguably, largely responsible for global warming, which could in the future prove to be environmentally catastrophic if moves are not made to halt it. Domestic users are the fourth biggest producers of carbon emissions, after taking into account the literal waste in carbon produced during the production of energy, carbon burnt for transport purposes and carbon produced by businesses. It is also, perhaps, the area that is most directly within the hands of the general public. This makes it essential that domestic energy use is significantly reduced by the individual, if the U.K. is to reach targets agreed under the International Kyoto Protocol for Climate Change. Government initiatives to encourage energy supply companies to produce sustainable forms of energy abound, but until this is achieved it will be up to the consumer to curb their energy output. The government currently calculates that domestic emissions are well on target to meet a 10% reduction on their 1990 levels by 2010. However, this is no case for complacency, and further reductions will offset the gross increase in emissions that will come from, for example, increased air travel. The government have set up the 'Energy Saving Trust' to ensure further reductions in energy waste are achieved The trust advises on domestic as well as business practice and encourages a range of environmentally sustainable initiatives. Insulate your home: Double Glazing and cavity wall insulation, together with effective floor, roof and pipe insulation will help to save on energy consumed through compensating for heat loss. Double-glazing will help to reduce the heat lost through your windows by 50%, whilst insulation can reduce heat loss by a further 30%. Although all of these measures will involve initial financial outlay, energy saving will soon save you money as well as contributing to a safer environment. Don't leave appliances or lights on when you are not using them. Don't leave your computer, television and stereo on standby whilst you are not using them. Don't charge your mobile phone unless you need to. Avoid, wherever possible, the use of dishwashers and tumble driers. They are largely unnecessary, very wasteful appliances. Don't leave kitchen or bathroom tap running unnecessarily. 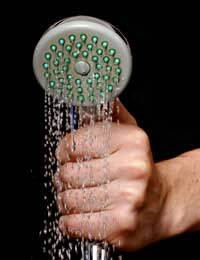 This is even more the case with hot water, which should only be used where cold water is not suitable. It is easy to fall into the trap of not considering it important to, for example, turn the lights out when you are not in a certain room; after all, light bulbs use relatively little electricity. However, this attitude over a lifetime, and across an entire planet, has a detrimental impact on the environment. Responsibility for climate change really stats in the home! Every human must play his due role for green future of this earth at any cost.